or... "How Do You Dew?" Imagine that you're out with the scope. It's been warm during the day - a little humid. But you've let your scope cool down as the sunset progressed to twilight and now it's dark and everything is in thermodynamic equilibrium (the telescope, optics and the ambient air temperature are all equal.) Then you notice that the front corrector plate on your Schmidt-Cassegrain is fogging up - "dewing" as amateur astronomers call it. Why is that? Everything is at the same temperature, so what's causing the condensation to form? The answer lies in the cold depths of space. The most common equipment hassle that observers face at night is water on the telescope, which comes as a surprise to newcomers who expect things to stay dry in clear weather. Unfortunately, the steadiest, sharpest telescopic views are often had under precisely the atmospheric conditions that cause dew to form. At the eyepiece you first notice dim stars and galaxies becoming harder to see, then bright stars develop fuzzy halos -- and a check with the flashlight reveals wet haze coating the optics. In severe cases the whole telescope may be soaked. Wiping never helps (and can hurt the multi-coatings! ); more water condenses the moment you stop. At this point many observers pack up, defeated. However, you can keep your lenses and mirrors crystal clear in even the heaviest dewing conditions. You just need to understand the enemy and take effective countermeasures. Dew does not "fall" from the sky. It condenses from the surrounding air onto any object that's colder than the air's dew point. The dew point (or saturation line), often mentioned in weather broadcasts, depends on both temperature and humidity. When the humidity is 100 percent, the dew point is the same as the air temperature. At lower humidity, the dew point is below the air temperature. If it's below freezing, you get frost instead of liquid water. An example of dew physics occurs when you take a bottle out of the refrigerator. If the bottle is colder than the air's dew point, it drips with condensation. Your telescope is the bottle. Great! So dewing occurs when the temperature of the Schmidt-Cassegrain corrector plate falls below the air temperature by some amount. How's this possible? Isn't everything is in thermal equilibrium - the scope, the air... ?? There are three methods of heat transfer - conduction, convection, and radiation. The key here is radiation. The telescope, if pointed at clear sky, is in "thermal contact" by radiation with a very cold source. At wavelengths where the atmosphere is transparent, it's only 'seeing' the 3 degree Kelvin background radiation of space. An example I like to use is that when I leave my car on the street overnight, I can find dew or frost on the front and back windows but not on the side windows. The same effect is responsible. The side windows are vertical, so they 'see' my house, the house across the street or trees, etc. - all of which are relatively warm and radiate infrared radiation. The front and back windows are sloped, so they are looking at the cold sky and cool well below the side windows. The first line of defense against dew, therefore, is to shield your optics from as much exposure to the night sky as is feasible. The traditional dewcap extending beyond a refractor's lens often serves this purpose well enough to keep the lens dry. The longer the dewcap, the more likely it is to work. One of the nice things about a Newtonian reflector is that its entire tube acts as a dewcap to shield the mirror in the bottom. An open-tube reflector, however, needs a cloth shroud around its open framework to gain this benefit. The cloth itself, of course, will get wet on its sky-facing side. The worst dew problems appear on exposed parts that are thin (or have low heat capacity) and rapidly radiate away their warmth. Schmidt-Cassegrain corrector plates are notorious for dewing; so are Telrad sights with their exposed glass. A dew shield is reportedly the first accessory that Schmidt-Cassegrain owners most often come back to buy. Orion makes a dew cap to fit most telescopes. You can easily make your own. A piece of tough 5/8-inch foam rubber, the kind sold in sporting-goods stores to go under sleeping bags, makes a dew shield that's cheap, durable, and very lightweight. The foam is an excellent insulator, for maximum effectiveness. If you're concerned that the cap might vignette the image (block some starlight near the edges of the field of view), you can cut the foam so it flares open at a very slight angle. A 3° opening angle should allow a 3° unvignetted field of view. As a rule of thumb, a dewcap should be at least 1½ times as long as the aperture is wide. A side benefit is that the cap also cuts down on stray light getting into the telescope. Eyepieces too are prone to dewing. Warm radiation from your face slows the process, but humidity from your eyeball and breath speeds it up. A tall rubber eyecup, the kind that extends above the eye lens all around, not only blocks stray light while you're observing but acts as a miniature dewcap when you're looking away. The same principle works on large scales. Early on a clear morning, have you noticed grass in the middle of a field white with frost or dew while grass near a tree has none? The tree is a giant dewcap, and it can work for you too. If you'll be looking at only one part of the sky, it's nice to have trees around and behind you. Not just your telescope but your charts and accessories will stay dry longer. Trees also reduce wind problems, but a slight breeze is a good thing. Radiational cooling is slow and inefficient compared to heat transfer with the surrounding air, so even the mildest breeze will keep your telescope nearly up to air temperature. There will be times and places where none of this is enough. You then have no choice but to warm your optics, usually electrically. A 120-volt hair dryer, used gently from a distance so it doesn't overheat the glass and warp it, will blow off dew for perhaps five minutes. Then you have to use it again. And again. A 12-volt auto windshield defogger gun is somewhat less effective. A better way is to apply a little heat continuously. Heated dewcaps that run off a 12-volt battery are advertised in Sky and Telescope magazine, or with just a little electrical know-how you can make an anti-dew heater to any size, shape, and specification you want. Orion makes the "Dew Zapper" that many have found very successful. Warmed optics can have unexpected benefits. Dew works its first subtle evils before you notice anything. The late Walter Scott Houston used electric warmers on both the objective and eyepiece holder of his 4-inch refractor. When he turned off the power, the telescope could lose a whole magnitude of light grasp before the objective actually looked dewy. "Even on nights when dewing is not noticeable," Houston wrote, "the star images seem better with the heaters on than without them!" This may be because, contrary to what you might think, gentle heating keeps a telescope close to the temperature of the surrounding air. After all, the whole idea is to stop it from growing colder than the air. The most destructive dewing happens when a telescope is in storage. No telescope should be closed up and put away until it is thoroughly dry. Water with nowhere to escape, or condensation that forms and evaporates repeatedly in a sealed environment over months and years, may attack optical coatings and ultimately etch the glass itself. How, you may ask, does water get into an airtight space that was dry when you sealed it? The answer is it was there all along. Air contains water vapor, and if your telescope gets colder than what the dew point was when the air was sealed in, water will condense. This is why so many puzzled telescope owners discover water stains on the inside surfaces of their corrector plates and refractor lenses. Several approaches can prevent this. Don't move a sealed telescope from warm to cold storage. In fact, sealing may be a bad idea altogether. The best telescope covering is cloth, which will "breathe." It keeps dust off but lets water vapor out. And you might want to leave the eyepiece holder covered only with cloth, just enough to keep dust and spiders out. The worst problems occur when a warm front of humid air blows in after cold weather, as often happens in early spring. Everything cold gets drenched. A cloth wrap may be the best defense here too; it will greatly reduce the amount of humid air that can flow over cold parts. 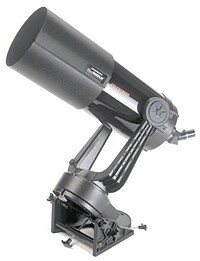 The usual advice is to store a telescope at the outdoor temperature to minimize tube currents when you set it up. But this old rule may need modification. Keeping the telescope a little warmer will tend to thwart condensation. An enclosed porch or attached garage may provide the extra few degrees you need. And really long-term storage should probably be inside your living space. Never leave a telescope in a damp basement or garage or, as a rule of thumb, any place where tools grow rusty. You can take active countermeasures too. A 4- or 7-watt light bulb inserted into a blanketed telescope makes a nice low-power heater. Position it just below or right next to the glass, or else you may merely drive off water from other parts of the tube that will condense onto the cold optics. Running the bulb continuously will cost about a dollar per watt per year. You might turn it on only in the damp season, or attach it to a humidistat switch. Silica gel desiccant will dehumidify the air in a tightly sealed enclosure. I keep a ¾-pound bag in plastic webbing attached to the inside of one of the tube caps of my 12.5-inch reflector. Every month or two when the bag's indicator slip turns from blue to pink, I heat the bag in a toaster oven in my observatory to drive off the collected moisture. The more tightly you seal your tube or storage case, the less often you'll have to do this. knowledge will keep it permanently at bay. Adapted from "Dealing With Dew," By Alan MacRobert, an Associate Editor of Sky & Telescope magazine and an avid backyard astronomer. With the change of seasons, you may notice dew forming on the front lens or corrector plate of your telescope or binoculars. Have you seen the symptoms? Dim stars become hard to see, bright stars get a halo around them, and your observations come to an end for the evening. Dew forms when your optics cool to a temperature below the “dew point” where water will condense out of the air onto any surface colder than this temperature. What happens is that while you and your optics are typically looking at cold, black space, the surrounding air is warmed by residual heat of the land around you. Dew condenses out of the surrounding air like the moisture that condenses on the outside of a glass of ice water. Dew doesn't damage a telescope, but it can sure ruin a night of observing. I'm sure that you know that just wiping the dew off with a soft cloth can scratch your optics, so a better solution is to understand how to prevent its formation in the first place. A dew cap for a refractor or Schmidt-Cassegrain telescope should be at least 1.5 times longer than the diameter of the front of the telescope. A tough 5/8" piece of closed cell foam, like the kind used for sleeping bag backpacking pads, is ideal, especially the black pads. They're lightweight and durable. This material can be found at most sporting goods stores and is easy to cut cleanly with a utility knife. Take the pad and wrap it around the telescope tube, then add 1-2 inches for room for attachment and cut the pad. Use a full length strip of self-sticking Velcro to secure the dew cap together. If you use a black pad, your new dew cap will have the added benefit of effectively blocking stray light out of the optics. If you're concerned about vignetting, make your dew cap so that it flares open approximately 3°, which will be sufficient for wide-angle eyepieces. To store the dew cap, slide it down the telescope tube, which will make it convenient to use and protect the tube from dings. One nice thing about a Newtonian Reflector is that the entire tube acts as a dew cap. The only way to get rid of dew in this case is to use a small hair dryer to get it off of the main mirror. When not looking at something, point the scope downwards to the horizon so that you're not pointing the optics at cold space. Dew can also form on eyepieces, but the heat from your face helps to keep it at bay, and at the same time moisture from your breath and eye is making the situation worse! Warming an eyepiece in a pocket for a few moments is usually enough to remove dew and keep it at bay for a while. By the way, a dew cap is usually the first accessory that an owner of a Schmidt-Cassegrain telescope purchases. But now you can save yourself a lot of money and make one yourself.